Kidlet has 2 PB&J Pockets, carrots and cucumber in the main compartment. On the side there is Vanilla-Orange Chobani Champions yogurt with a natural fruit leather spooky cat shape, strawberries, blackberries, and an apple bat. Check out the awesome lunch Sarah made at Bentoriffic! Your lunch is awesome!! I love your PB&J Pockets! Love it all! So creative as always! Never would have thought to use pie dough to make little pockets like that! I like the gravestone one, very nice. Keep up the spooky work! I love how the tombstone looks so gray and black - is that from the jelly inside? it looks cool! Great job. Looks yummy too! And the cat is really cute! I love the pocket sandwiches and the cute red cat ~ cute lunch! Love the whole scene & the cute fence too. Always so creative! Love the pockets - I'm going to steal that. The ghost is the perfect shape for it! What a great idea for the little sandwiches! I have no kidlets and I can barely brownbag my own lunch but I'm intrigued. What do you do with the rest of apple when you cut out shapes or make checkerboards? Do you eat it in your lunch? Do you save the apple for the next day? Small scraps I will eat or we will have in fruit salad at dinner :) If it's a big piece I will save it for the next day! Love your sammie pockets! Great idea and thanks for sharing the tutorial! The PB&J sounds yummy and look great!! 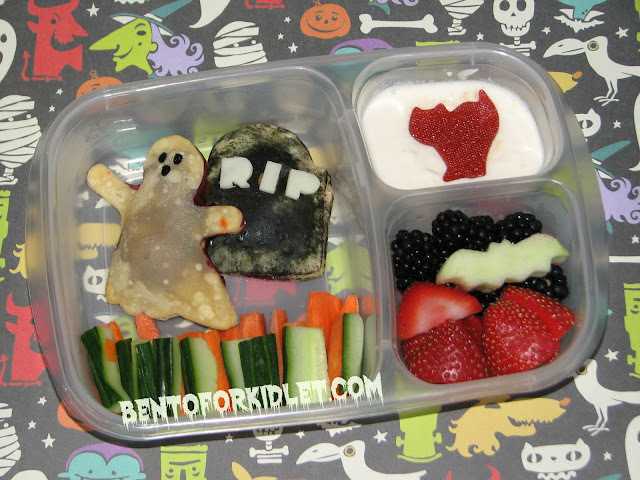 That's one spooky lookin' lunch! We're happy to be included. I am going to have to try and make your PB&J pocket sandwiches. wow Jelly pocket looks yummy and YES cute!